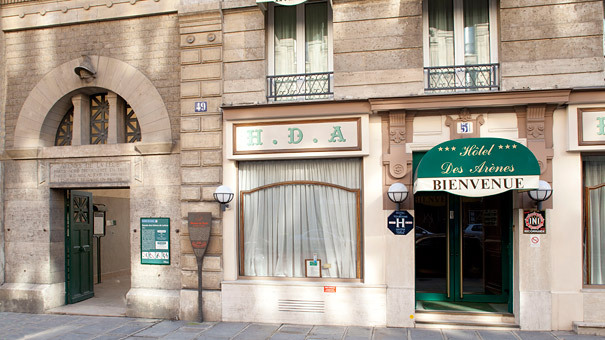 Because the Hotel des Arènes is so ideally located in the French capital, it is easy to get to many of Paris’s most famous monuments and places of interest. 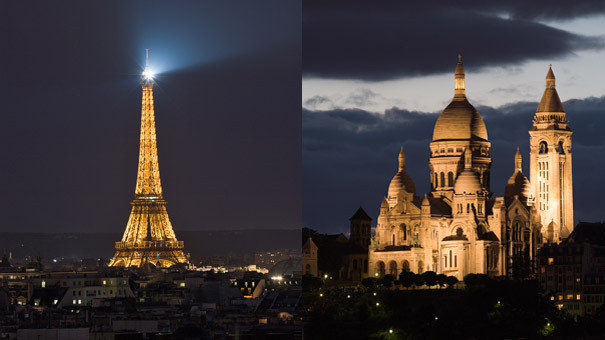 Discover the Saint-Michel neighbourhood on the banks of the River Seine or stop off on the famous Ile Saint-Louis, one of the River Seine’s two remaining natural islets. 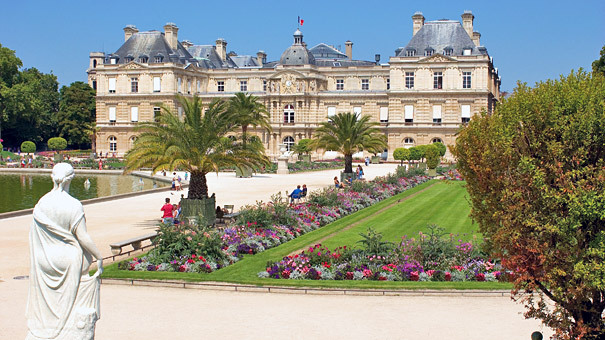 Stroll along the Boulevard Saint-Germain, then take in the Jardin des Plantes botanical gardens, the Luxembourg Gardens, and the Cathedral of Notre Dame, which is only a few metres from the hotel. 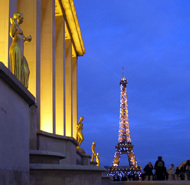 Why not tour Paris by bicycle? There are many VELIB rent-a-bike stands in the vicinity of the hotel. You can rent bikes by the day or by the hour. 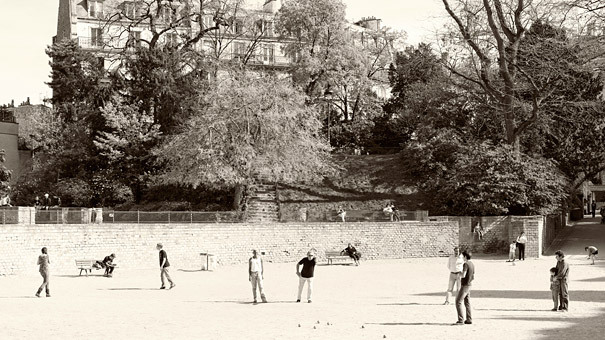 The 5th arrondissement is one of Paris’s most atypical historical districts. 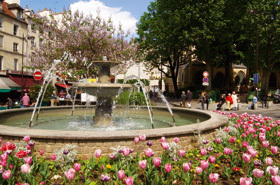 The Hotel des Arènes is surrounded by monuments and places steeped in history. 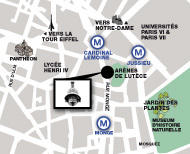 Just two streets away from the hotel, the domed roof of the Pantheon towers over the Latin Quarter, while the Arènes de Lutèce lie opposite the hotel. Some rooms in the east wing enjoy a full view of this Roman amphitheatre. This fine brasserie boasts a varied menu: salads, hamburgers, omelettes with the fillings of your choice, etc. Enjoy the first rays of spring sunshine and its very well appointed terrace. 14 rue Monge – 75005 Paris. Savour this patisserie’s selection of breads, gateaux, cakes and succulent pastries. 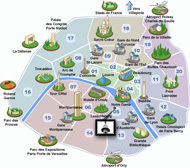 Take the A6b branch of the motorway in the direction of Créteil/ Versailles/ Antony, then take exit 1, “Porte d’Italie”. Follow the Rue Élisée Reclus then turn left into the Avenue de la Porte d’Italie. 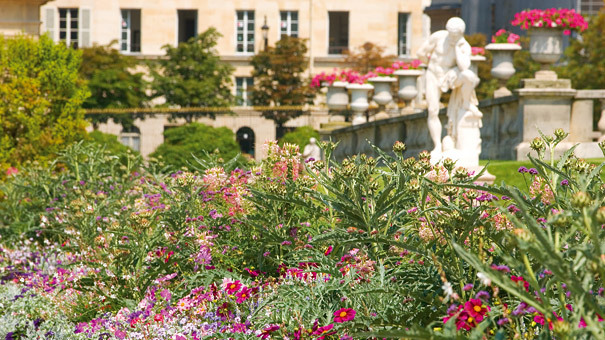 Drive straight on along the Avenue des Gobelins until you come to the Rue Monge. Follow the signs to Palaiseau/ Paris, then Rungis/ Paris. 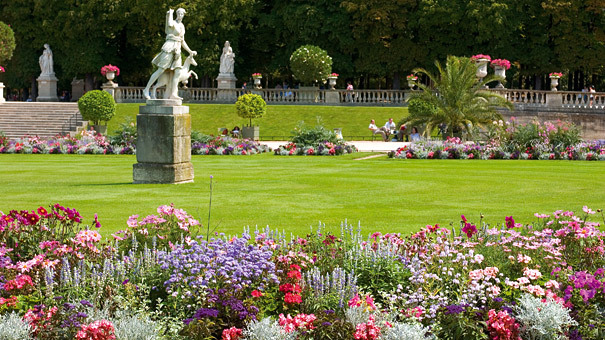 Take the N186 in the direction of Antony/ L’Hay-Les-Roses/Versailles. Take exit 1, “Porte d’Italie”. Follow the Rue Élisée Reclus then turn left into the Avenue de la Porte d’Italie. 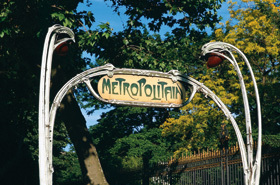 Drive straight on along the Avenue des Gobelins until you come to the Rue Monge. Take the Landy Tunnel into Paris. Turn right into the Avenue Porte de la Chapelle, then drive straight on along the Rue de la Chapelle and Rue Marx Dormoy. 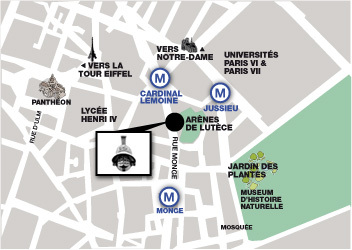 Turn left into the Boulevard de la Chapelle, then head in the direction of Rue Faubourg Saint-Martin. Turn left into Boulevard de Magenta. 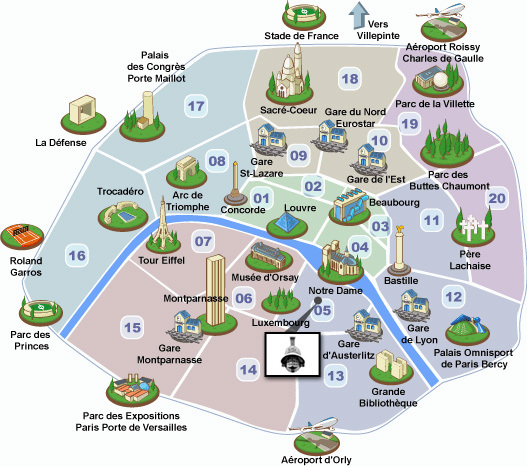 After the Place de la République, follow the Rue Beaubourg, Rue du Renard, Rue de la Coutellerie, the Avenue Victoria, Rue Saint-Martin, then straight on to the Place du Petit Pont. Turn left into Boulevard Saint-Germain, then continue along Rue Monge. Bus no. 47, Place Monge station.